Winter's Eve and Singing in the Rain Collections. 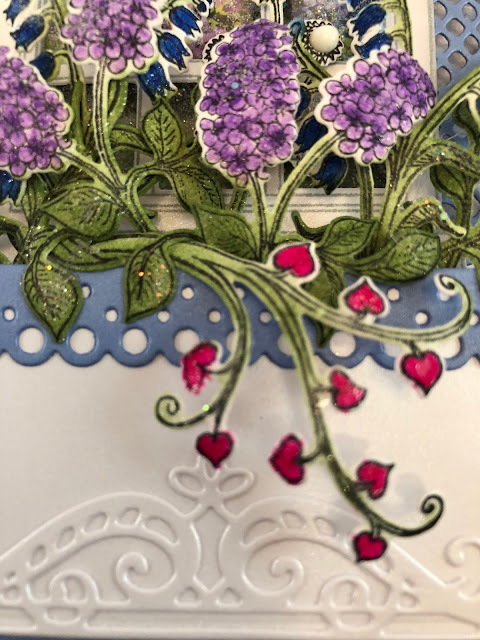 Other Products: Pearl White Metallic Cardstock, Blue Metallic Cardstock, Crafters Companion Dry Stone Wall Embossing Folder, Dimensional Tape, Sponge, Sparkle Sheer Shimmer Spritz, Memento London Fog Ink, Hot Glue Gun, Zig Clean Color Real Brush Markers: Cornflower Blue, Dark Pink and Violet. Instructions:Create a 5” x 7” card base from white linen metallic cardstock. Cut a metallic blue mat layer 4 7/8” x 6 7/8”. Cut a white pearl mat 4 3/4” x 6 3/4”and emboss with embossing folder. Adhere the blue mat to the card base with Dries Clear Adhesive. Adhere the white embossed layer to card base with dimensional tape. Cut another piece of designer paper 4 7/8” x 6 7/8”, ink the edges and adhere to the inside of the card. Stamp the window on pearl white metallic cardstock with London Fog Ink and cut out with matching die. Adhere clear cardstock to the back of the window frame. Cut a piece of the designer paper, add glitter and adhere to the clear cardstock using Darice adhesive foam strips. 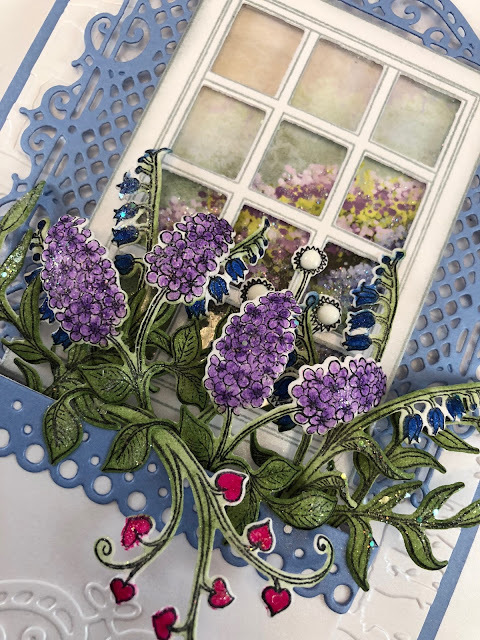 Cut out all the pieces from the Window Box Elements Die set from blue metallic cardstock and adhere to the window with Dries Clear Adhesive as shown. Adhere the window to the card base using dimension tape. Stamp the window on pearl white metallic cardstock with London Fog Ink, cut out with matching die and ink the edges. Adhere clear cardstock to the back of the window frame. Cut a piece of the designer paper, add glitter and adhere to the clear cardstock using Darice adhesive foam strips. Cut out all the pieces from the Window Box Elements Die set from blue metallic cardstock and adhere to the window with Dries Clear Adhesive as shown. Adhere the window to the card base using dimension tape. Diecut the window box from pearl white metallic cardstock and assemble using dries clear adhesive. Cut another window box elements die from pearl white cardstock, trim and adhere to window box along with the blue window box trim. Adhere the window box to the card base. Stamp the blossoms and leaves from the Rain Boots and Blossoms cling stamp set on white cardstock with Memento Tuxedo Black Ink. Color the stems and leaves with Bamboo Leaves ink using the Stack and Store Daubers. Color the blossoms with the Zig Clean Color Real Brush markers. Shape with the Deluxe Flower Shaping Kit and spray with Sparkle Sheer Shimmer Spritz. Add drops of Nuvo White Crystal Drops to the centers of the puff blossoms. 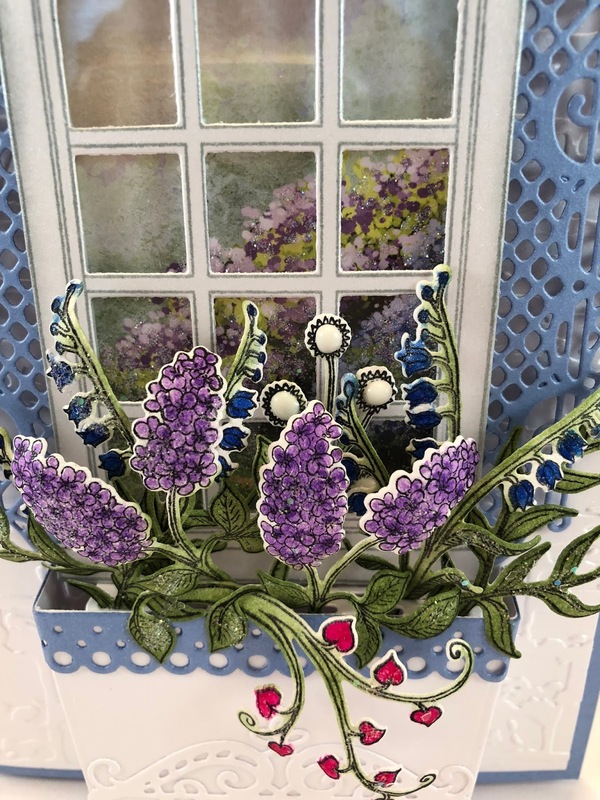 Add the blossoms and leaves to the window box using hot glue gun. Sponge them with dries clear adhesive and sprinkle with Rajni Chawla’s Crystal Clear. 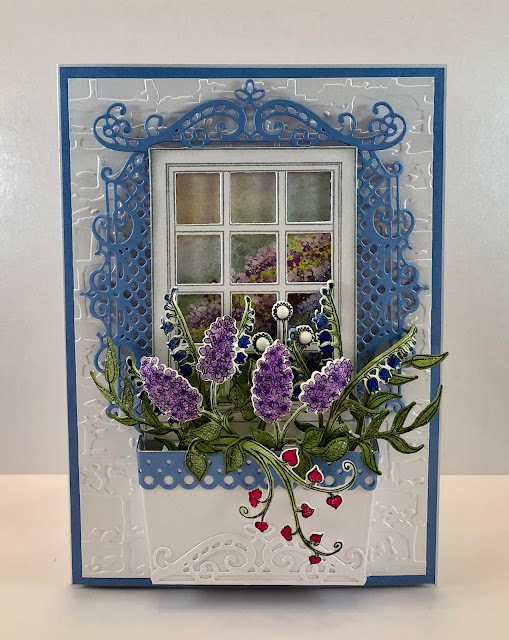 What a beautiful card with the window frame. Hey Janet, long time no see, LOL!! Wasn't that so much fun at Creativation? I love your beautiful card sweet friend! Love that wall embossing, gorgeous project!